This week you may have heard us banging on about a very special date in our blogging calendar - yes, it's National Afternoon Tea Week. Bring on the scones, pretty pastries and lashings of tea, as we celebrate our favourite afternoon ritual and you could be celebrating too with our fantastic giveaway! 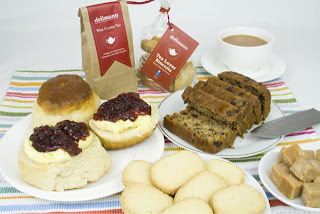 Last week we were lucky enough to try one of Delimann's fab afternoon tea gift boxes. Packed with everything you need to bring the tea room to your kitchen, we indulged in Delimann's oversized scones, Devon fudge and signature biscuits and now we're offering you the chance to do the same. We've joined forces with the lovely people at the Deli, to offer our readers the chance to win a Traditional Cream Tea delivered straight to their door. Excited? Read on. Traditional Tea Bread - Delicious signature tea bread, perfect buttered or even toasted. Oh we are good to you. In which town is The Delimann based? Entries must be received by midnight on Saturday 17th August and the winner will be announced this Sunday. Terms and Conditions: Open to UK residents only. Only one entry per person. Competition will close at midnight on 17/08/2013. The winner will be chosen at random and announced on 18/08/2013. The Afternoon Tea Club's decision is final and no correspondence will be entered into. There will be no cash alternative. Winner will be notified via email. By entering the competition the winner agrees to participate in such promotional activity on our website and Twitter. No responsibility can be taken for any entries which are not recieved for any reason. The winner must be able to provide their own transport to and from the venue and accommodation should this be necessary. 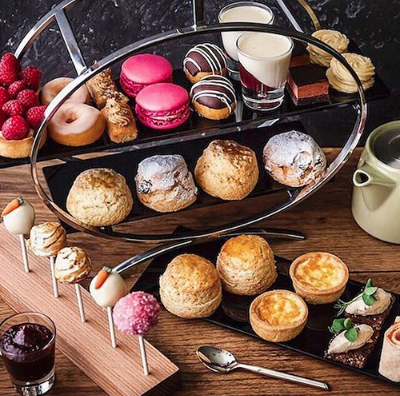 The Afternoon Tea Club operates as a separate entity to delimann.co.uk.